Sometimes people decorate their wedding with flowers and lights. They pick a venue and bring in a DJ with speakers and set up hundreds of chairs. 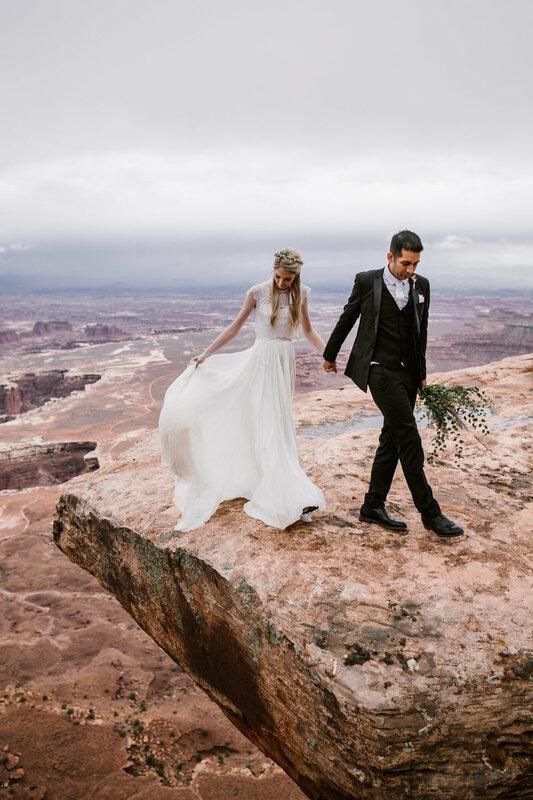 Other times, they bring their wedding to where the flowers grow (on cacti), and the only light is natural. 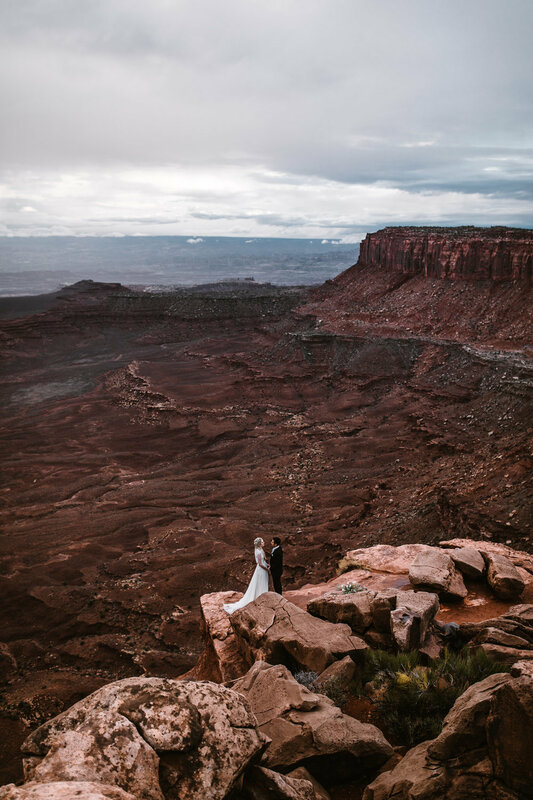 The venue is the best looking platform above a cliff they can find, and the only seats are boulders and the only sounds are that which nature chooses. 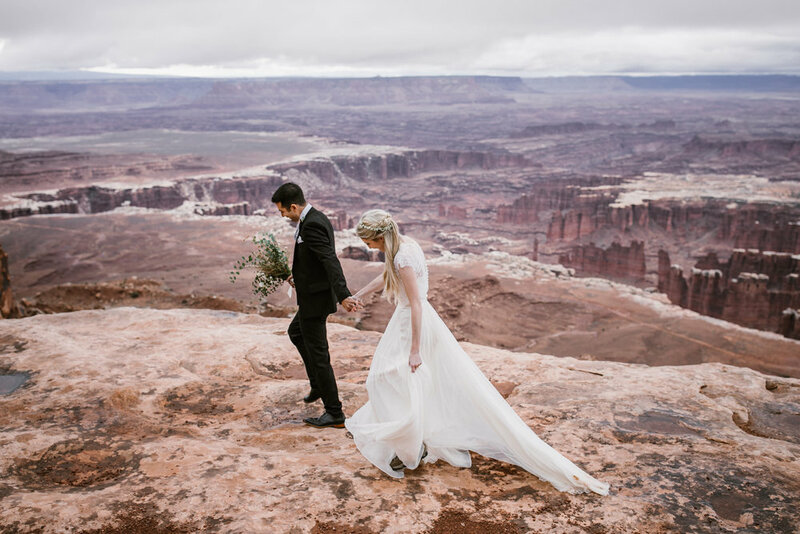 Katelyn and David decided to go the route of having mother nature be their wedding planner (with a little location scouting help from us) and weren't disappointed. 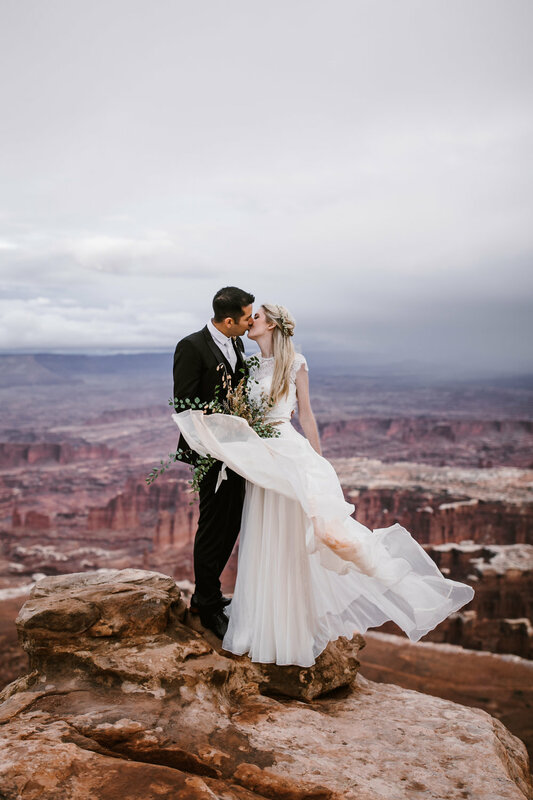 The week leading up to their big day was filled with storms and some pretty harsh fall weather in Moab. 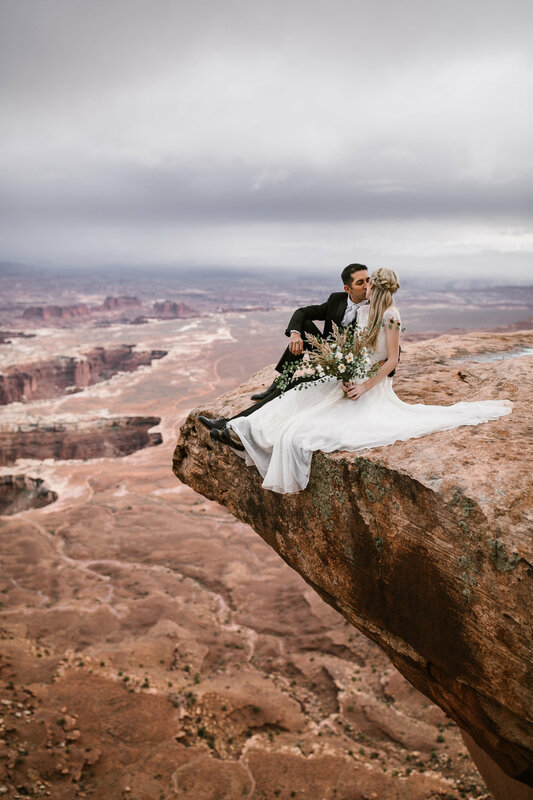 Thankfully, their wedding day brought a break in the clouds which resulted in some epic photo ops. 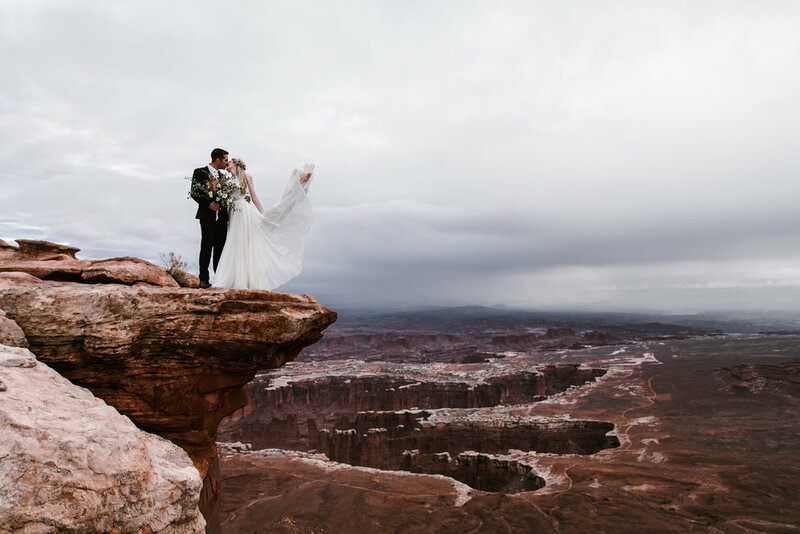 While weather seems daunting a lot of the time, I love how some of our favorite memories and photos come from conditions most people worry about. 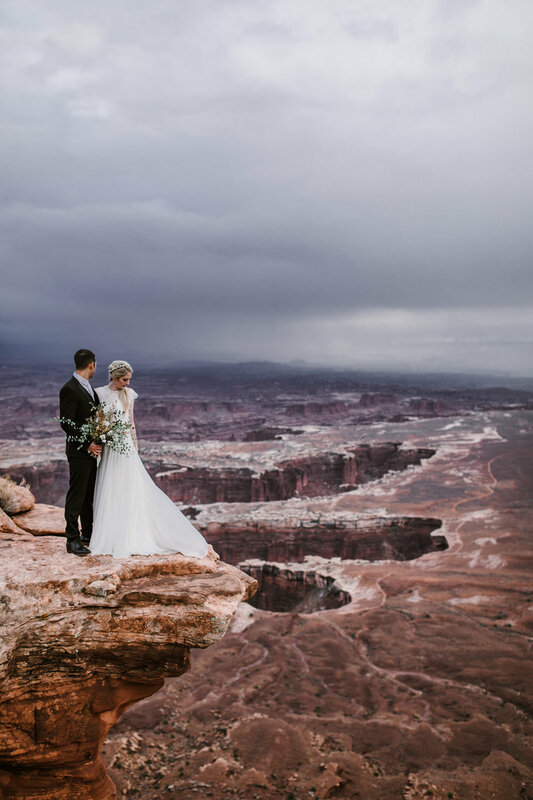 This was the case with David and Katelyn as the wind ripped through canyons and pushed storms across the desert floor in the distance. I found out when we first started talking that a less traditional route was natural for these two. In fact, this wasn't exactly a wedding at all, but rather an announcement! David and Katelyn's wedding actually happened two and a half years before in a courthouse ceremony. They had kept it under wraps the entire time since (if I ever need to keep a secret safe with someone, I'm calling Katelyn)! So the whole day felt more like an adventure and celebration! Honestly, though, the whole day felt perfect for them. They met while working at the same grocery store. Actually, Katelyn trained David as a service specialist, and they started dating almost a year later. In the ten years since then getting outside had become a place for David and Katelyn to get away together. 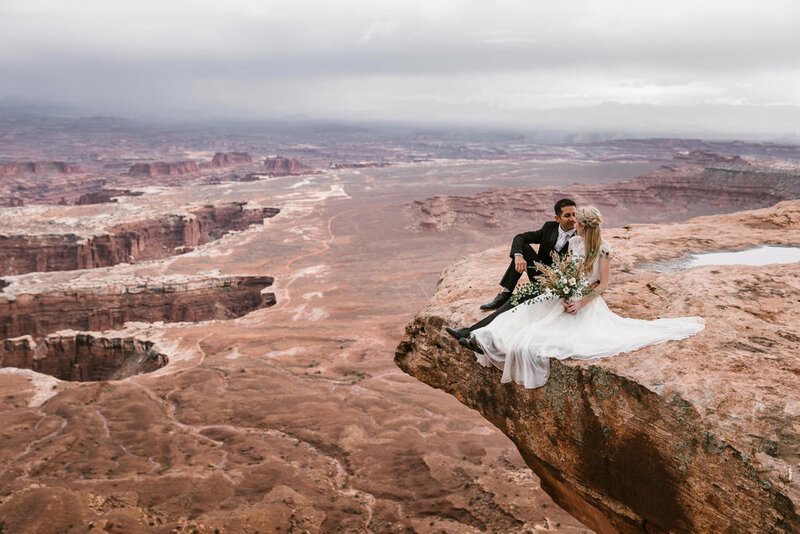 They'd taken annual trips together to Montana and were stoked to get out into Moab. 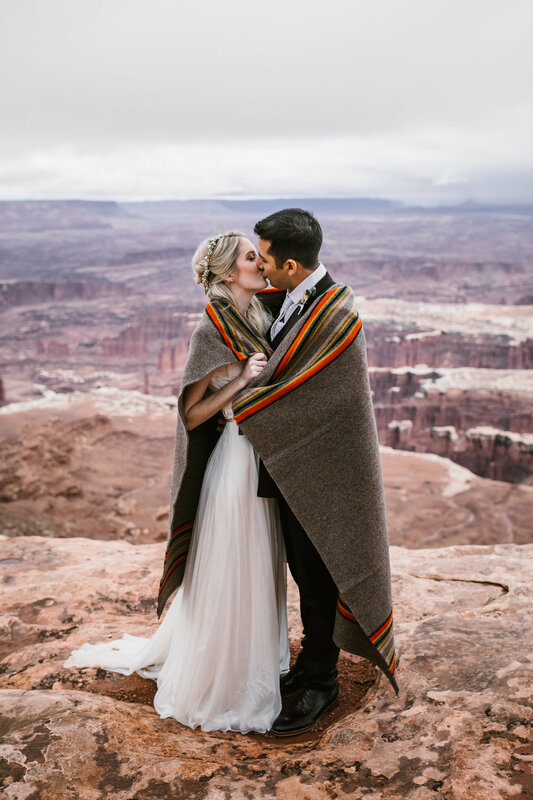 We were really excited to work with a few of our favorite vendors again too! 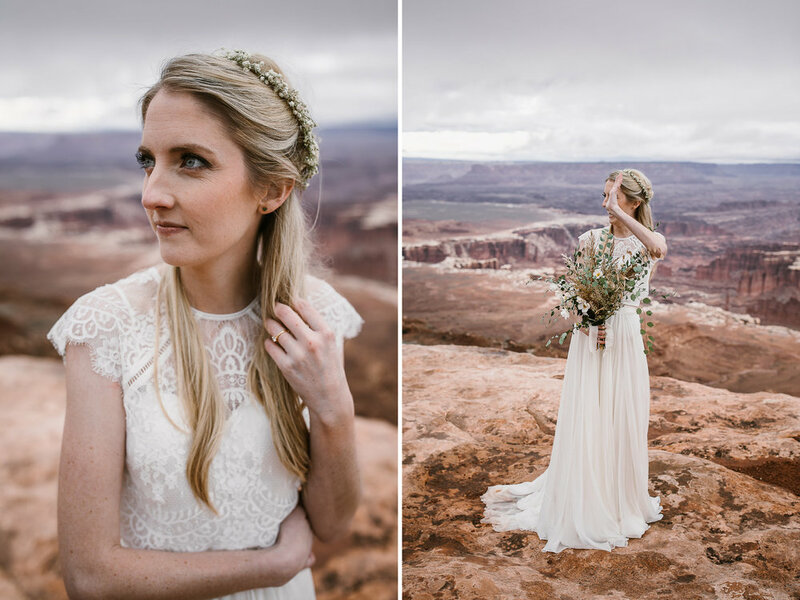 Katelyn chose a BHLDN dress (some of our favorite elopement dresses are BHLDN! 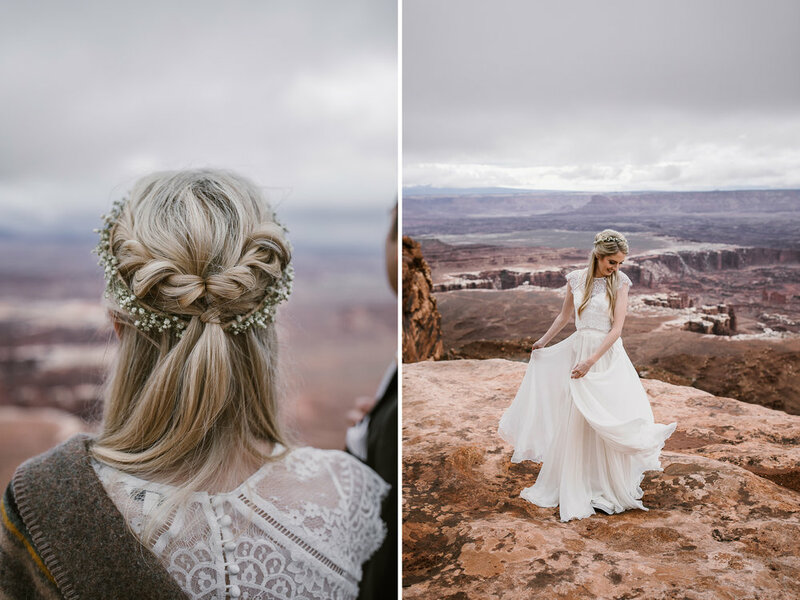 ), hair + makeup by Lesley Lind, and the bouquet came from Tellurian Events. 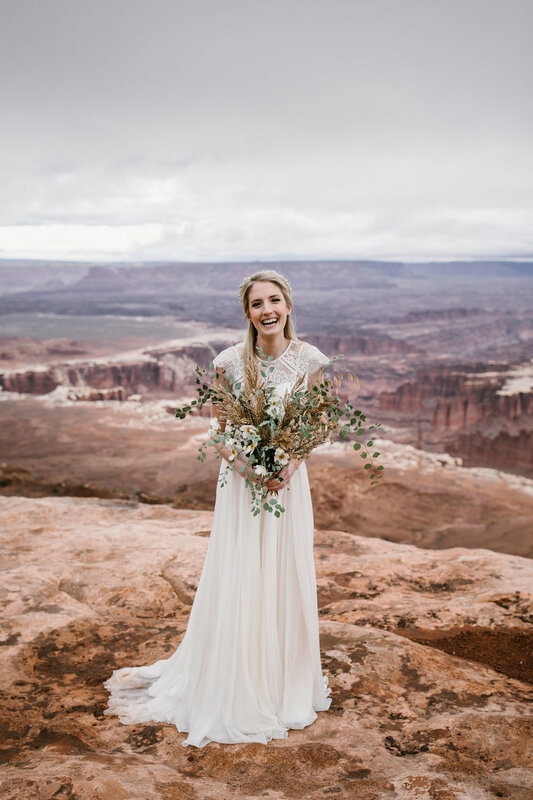 I love Tellurian because they're perfect for elopements as they work with locally available florals to make amazing, one of a kind, eco-friendly bouquets. 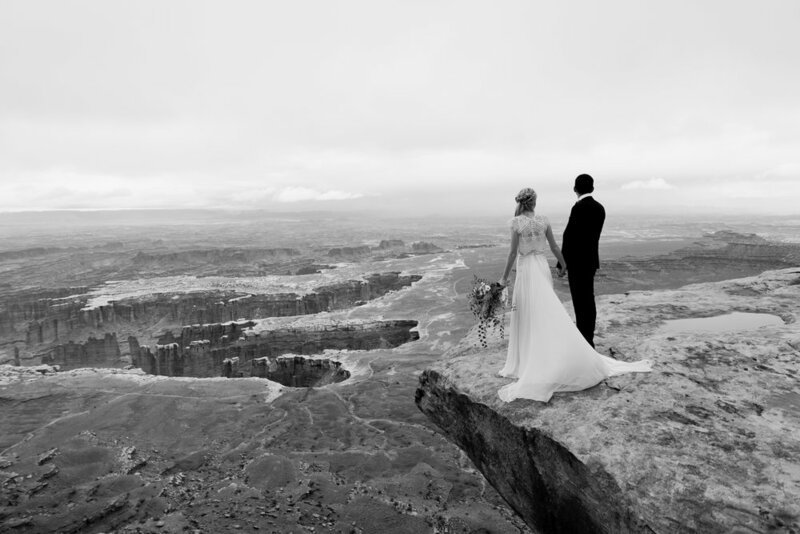 Katelyn's was perfect! The flowers were lightweight which made for easy hiking, but it still looked stunning in all the photos! 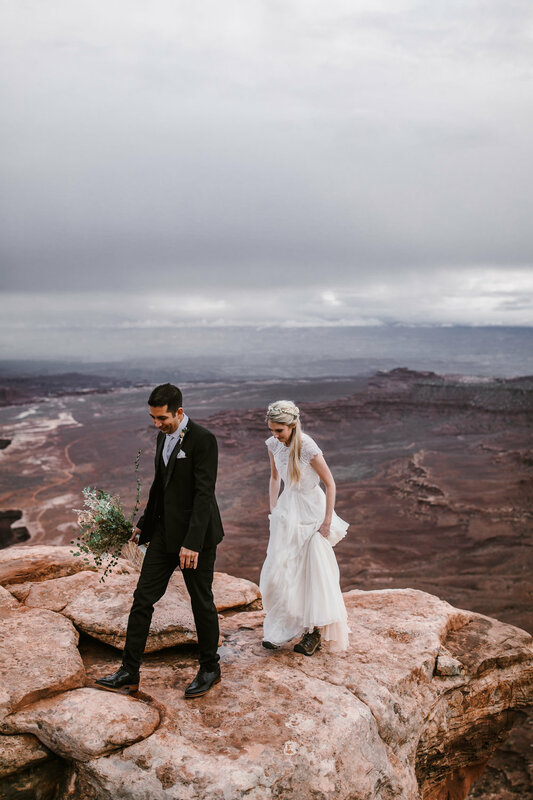 Getting our couples out into the desert is my favorite part of the day. 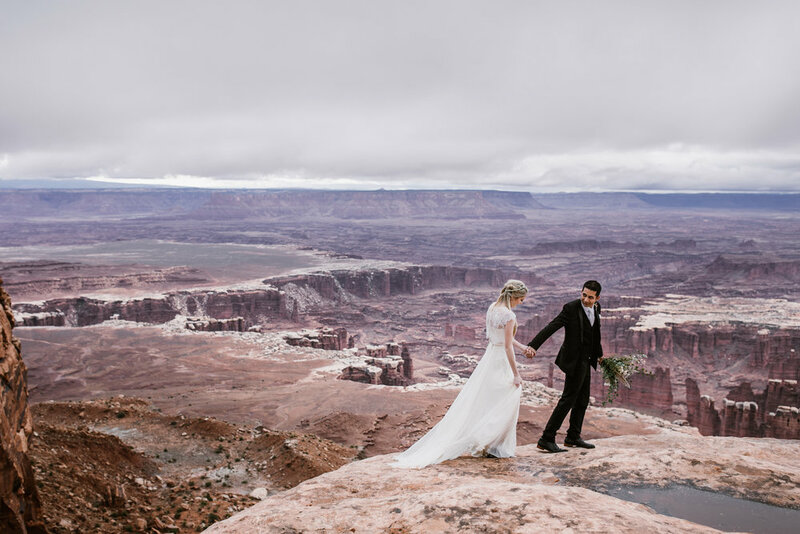 I'm always super excited to get them to the location(s) we picked for their day. It's kind of like waiting for someone to unwrap a present you're really excited for them to open. Katelyn had told me how much she and David are "opposites, but perfect for each other." I definitely saw that come out in them and thought about how a rainy day in the desert fit them perfectly. We hiked out to a beautiful vista. 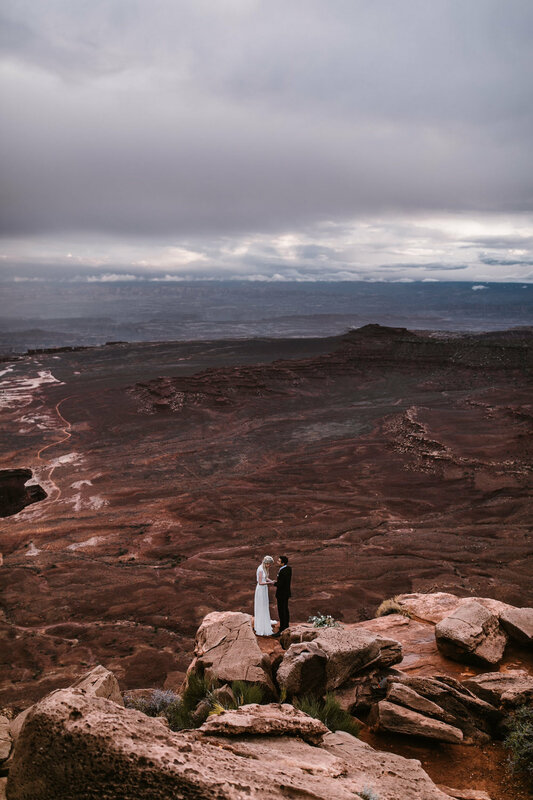 I watched from a distance as they stood on the edge of a mesa to read their vows, clouds rolled by in the distance, rain trailing underneath. Days like this in the desert create a contrast of dark and light. Reds turn shades of crimson as they soak up the rain and the whites come alive and almost seem to glow against the desert floor. As dusk arrived, the light began to dance against the distant cliffs. The clouds made scale of the deserts massive reach and towers sticking up all around. 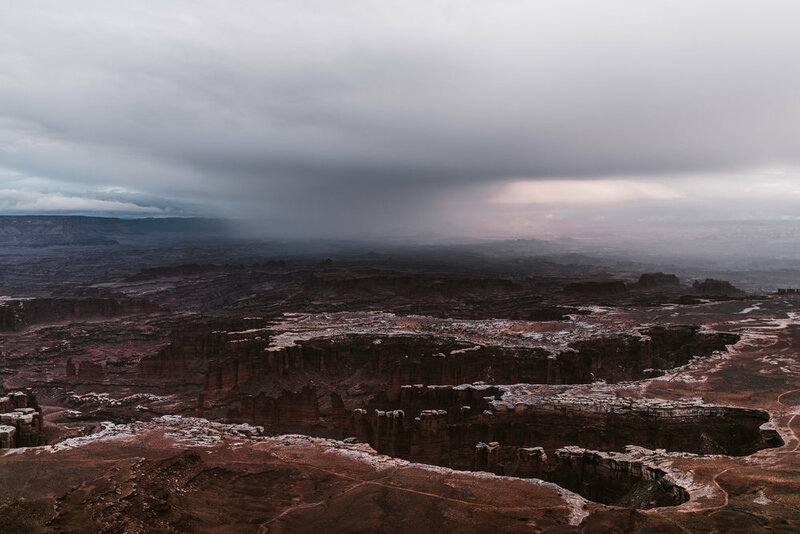 The storm in the distance was wild, our couple matching its quiet intensity with theirs. 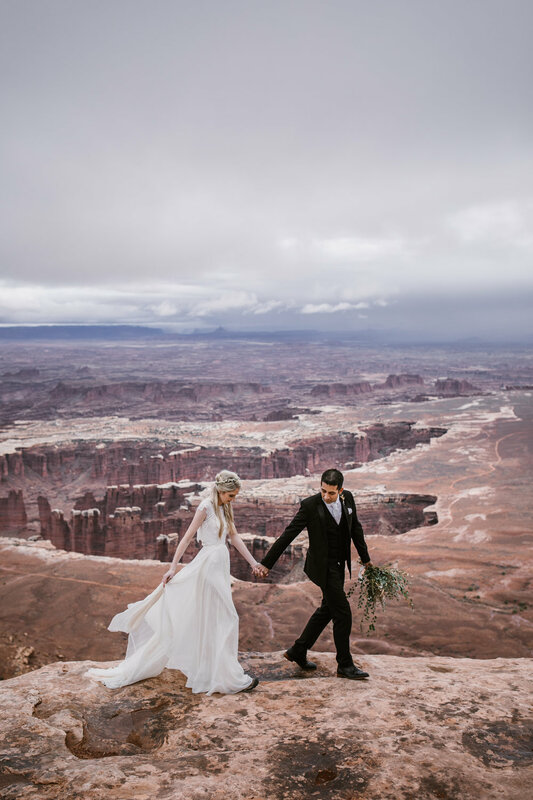 They walked along the edges of the cliffs as opposites yet perfect together - Katelyn and David, a black suit and a white dress, loving each other like the desert loves the rain. At the very end of our time together it started raining, so we all piled into the camper for hot tea. Some of my favorite times with couples are spent sipping tea or coffee, unpacking the day, hearing stories and dragging our time out into the night. Katelyn and David were so thoughtful, they even gifted us a Yosemite scented candle (Yosemite in Moab... tears). Eventually, we said goodbye, but days like this are ones I won't soon forget. I'm so glad the everything turned out how it did for these two. 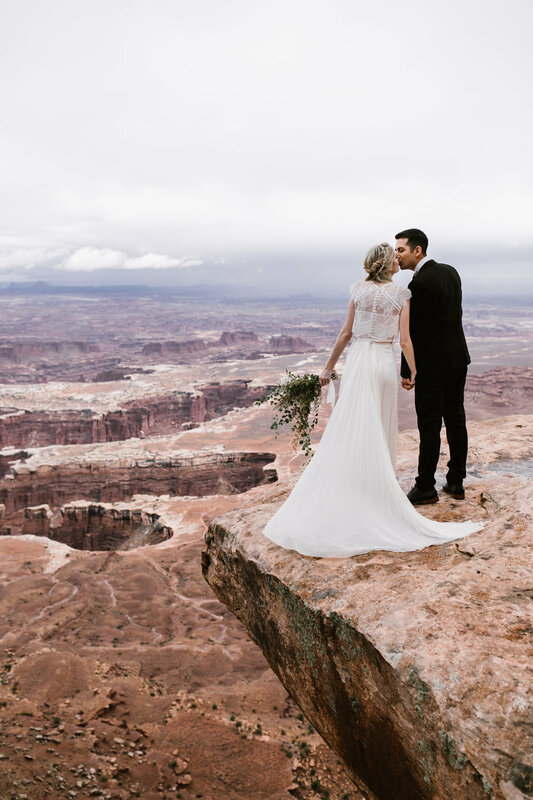 It's a story they'll get to tell forever about how they stood on a cliff's edge to officially announce their love to an audience of castles and clouds.